Uber has seen a sharp drop in retention rates for new drivers in the U.S., according to analysis of the Uber driver app provided to TechCrunch by app analytics firm Apptopia. In an analysis of app downloads and usage, Apptopia estimates that 30-day user retention for the Uber driver app in the U.S. has dropped 47 percent from January through May. This measure looks at the proportion of users opening the app each day after the initial day of download — continuing until the 30th day… the idea being to measure engagement meaningfully versus looking at app deletions (as lots of people just stop using an app versus actively deleting it). Apptopia’s analysis also indicates a 20 percent bump in downloads of the driver app over the same period. So — if the data crunching is correct — it appears that while Uber is successfully managing to drive initial interest from new drivers, it’s having serious trouble sustaining this interest. From April, retention rates appear to fall especially dramatically. For the two percentages it’s pulling here, it says it’s averaging its data from the Google Play Store and iOS App Store together — for, as it puts it, a “more holistic view” on interactions with the Uber driver app. We asked Uber if it had any comment on the data, but at the time of writing it had not responded. The company currently has no CEO in its own driving seat, after co-founder Travis Kalanick resigned following investor pressure applied in the wake of a report into its internal culture — triggered after a female former employee blogged about experiencing sexual harassment and sexism during her year at Uber. It’s unclear whether new Uber drivers are sensitive to Uber’s internal turmoil. Perhaps more likely is general dissatisfaction with lower rates of pay from Uber pool rides and Uber’s lack of an in-app tipping feature (versus Lyft having in-app tipping) — tellingly, this week Uber finally said it will start allowing riders to tip drivers via the app. Apptopia also looked at rider monthly usage for us, and on this said — perhaps surprisingly — that Uber hasn’t taken a hit due to #deleteuber — i.e. the social media campaign that sprung up aiming to convince Uber users to ditch the app as a result of the various ethical scandals being attached to it. 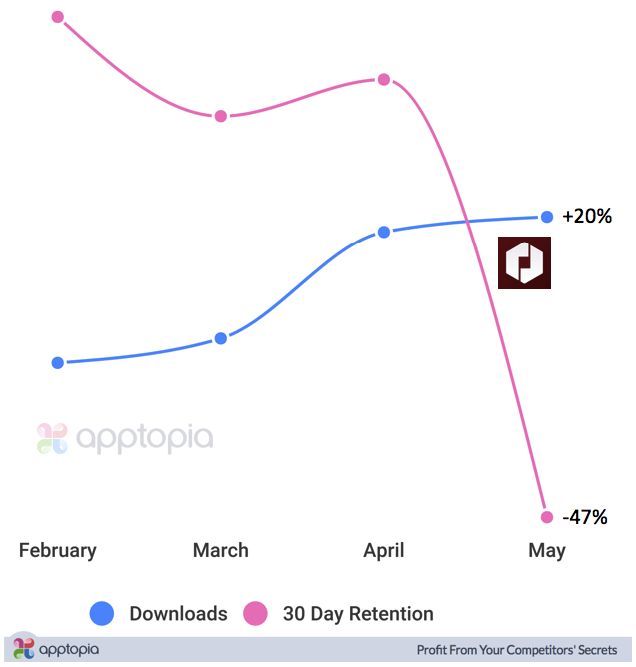 “It drove uninstalls but new downloads remained consistent so usage didn’t dip much,” said Apptopia of the #deleteuber movement. “Since February, monthly usage in the US (for riders) has actually increased around 60%.